An incident first reported in the Daily Item has officially gone viral. 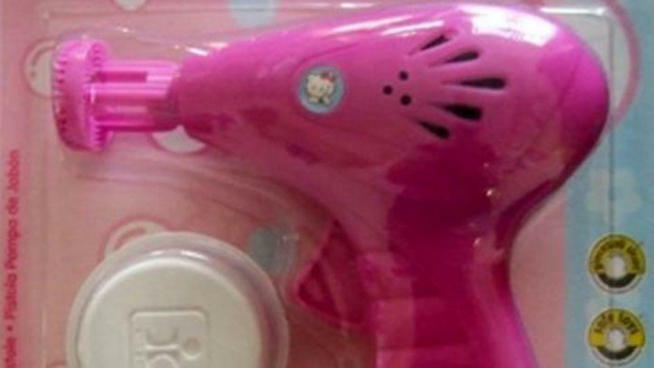 Numerous news outlets – including The Huffington Post, the New York Daily News, ABCNews (and GMA) and FOX News just to name a few – picked up on the story of a young girl suspended after “threatening” her friends with a Hello Kitty bubble gun (similar to the one pictured). The school says she made legitimate threats; her mother and lawyer say she’s just a 5-year-old girl saying things that she doesn’t fully understand. The story has attracted numerous reactions, both in support of the young girl and the school, with both sides citing recent events – some saying that school shootings have left the public oversensitive, while others say you can’t be too careful these days. A Facebook post we did on the subject got 94 comments. So now, the question is, what do you think?